I've been absent from the blogging world for too long! Because of this, I haven't been out in the sun much... good thing so many blog buds filled me in on the different tanning lotions to try when I blogged about it last month (here's the post). 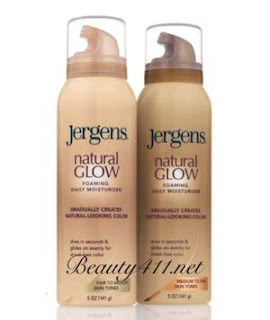 I had the best luck with the Jergens Natural Glow tanning FOAM. It goes on really easily, doesn't streak, dries quickly, and doesn't smell too bad. My only issues are around my hands. I can't quite seem to get my hands and wrists to look natural. I also like it much better than the lotion (which is what I originally used a few years back). 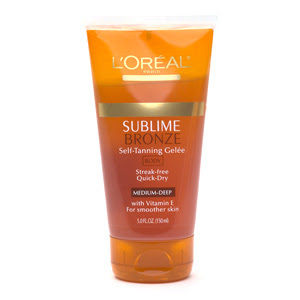 The other self tanner I used (because of your suggestions) was the L'oreal Sublime Bronze. This worked well, too. I could see where I was putting it because it has an instant tint. It was a little messier than the foam and for me harder to apply, but it worked pretty well. I had the same issue on my hands and feet because it doesn't spread as well as the foam, but I still liked it. I tried to get a little natural sunlight yesterday out on the boat with our friends. The weather is finally starting to feel more like summer. I am excited to get out and enjoy it! Hope you are having a fabulous week. Can you believe it is already June?! How are your summer activities going?? I've always had issues with self tanners turning the skin inbetween my fingers an awesome shade of oompa loompa orange :/ If you looking for a quick fix, try aribrush tan. Its awesome, affordable and lasts about two weeks and only takes about 30 mins! GOing to try the Jergen's sweet girl. I usually use Estee Lauder! hey! I've never tried it but I heard if you use gloves to apply it all over your body and then take a cotton ball and apply it to the top of you hands, it helps! good luck! I'd love to start using self-tanner but it scares me haha! I love using self tanners. For me the problem area is always always around my feet. I use the Loreal Sublime too, but I use the airbrush spray! It works great. 2-4 days it looks like I've been laying in the tanning bed for weeks, and I've tried everything from Jergens to L'oreal! It's worth a shot and the tube lasts a long time! Also the suggestion from keeping your hands from staining....I actually wad up a paper towel or toilet/tissue paper and apply the self tanner ON the paper then swipe UPWARDS ONLY....never down. I Love self tanners/ spray tans but i have never really found one that i love!! I worked at a tanning salon for a while and became a pro at the spray tan...never a line & my feet and hands looked great, well when i got a new job that got a bit expensive. After wards i started working a Hair Salon & Spa and we tried selling this new product called Fake Bake Lotion & i swear by it!! AMAZING!! Its inexpensive and has a green tint to it so it goes on brown, not orange. I take a quick shower before bed and exfoliate, and put it on all over my body (you have to use gloves though) & since you see it instantly, its easy to put it on wrists, hands, feet, ect. I put on some crappy PJ's then sleep on it and shower in the morning. I got all my friends and family using it! I have never tried the foam. I use the lotion and it helps but after too many times I turn orange and I don't like the smell so I don't ever wear it out. Make hand into a claw so all the tendens stick up. Holding the spray directly above my hand (about a foot and a half)I quickly spray a mist. Sounds silly but for me, I find it does make my hands look more natural. ps. i need to hear about these "changes" going on!!! my friends and i use face sprays. different ones but usually from nicer spa boutiques or sephora because we dont want to risk being orange. they work really well and i spray it on my body sometimes. Big changes?! I am excited! Don't keep us in suspense too long! As weird as it sounds, get some latex gloves to apply the tanner! Or I've used spray tans before that do a pretty good job! these things drive me crazy... i walk around with orange hands for days... eeeekkk what are we women suppose to do!!!!???? Happy Father's Day to my Dad!